Is my carpal tunnel occluded like the Lowry tunnel on Hwy 94 at 5pm? Is my neck out of joint? Am I having a stoke? A neutral posture comes from positive ergonomics. In my home town of St. Paul, Minnesota, there was a cartoon great names Charles Schultz; maybe you’ve heard of him. One of my favorite of his Peanuts characters was Schroeder. (If you need to use our great friend Google to look him up, you’re probably too young to be reading this!) If you look like Schroeder as you are working on your proposal you are in a forward-head position. I’m just a therapist, but if the laws of physics are correct, the fulcrum, or center-point, of your sitting position is in the joints of your neck. In neutral, your head weighs between 8-16#. In forward head, due to an increased lever arm against gravity, it is as if it weighs 45! 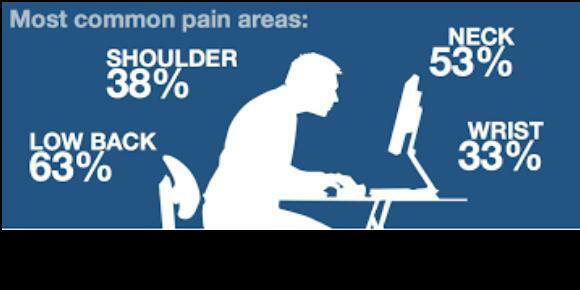 With positive ergonomics, you can work longer, smarter. How to get to neutral. As if someone is pulling on your hair at the top of your head, lengthen your spine, tuck your chin, and keep your shoulders down. Lumbar supports are great to decrease the amount of energy your muscles need to sustain neutral. Get rid of your tingling today!